The whole world was watching as Neymar da Silva arrived at Barça, with his presentation being a top news story in the international press. Images of the Brazilian striker wearing his new jersey have appeared on the covers of a number of newspapers and websites. What is sure to be one of the biggest transfer stories of the summer of 2013 has generated massive interest in the world’s press. “Neymar signs for five years and the Camp Nou is a fiesta”, says Italy’s 'Gazzetta dello Sport'. French sports daily ‘L’Équipe’ has said that Neymar’s dream will cost Barça 57 million euros, the number given by FCB vice president Josep MariaBartomeu. In Brazil, yesterday’s events at the Camp Nou were especially relevant. 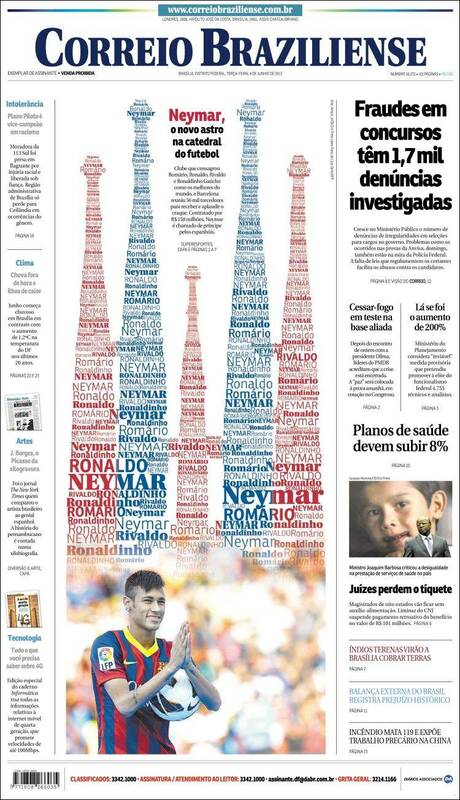 ‘Correio Braziliense’ has a photo of Neymar and the shape of a Barça coloured Sagrada Família on its cover. “Neymar, a new star in the football capital”, proclaims the headline. Lance, another Brazilian daily, echoes Neymar's word on Messi: "I want to help Messi to continue to be the best in the world." Another Brazilian paper, ‘O Globo’, headlined its article with "Brazil's Price arrives in Messi's kingdom." Turning our focus north, U.S based publications also hailed Neymar’s move to FC Barcelona. Sports Illustratedreports that the Brazilian star has already generated a lot of excitement among Barça players. “He’s coming to the best possible place for him,” says Andrés Iniesta. While Dani Alves likens Neymar to other great Brazilians who have graced the pitch of the Camp Nou, namely Romário, Ronaldo, Rivaldo and Ronaldinho. “Neymar gives us a Brazilian touch – the others left their mark, I’m sure he will too,” said the FC Barcelona right back. The Catalan daily El 9 Esportiu, who were impressed when Neymar greeted the crowd at the Camp Nou in Catalan, declares the Brazilian received a ‘Historic Welcome’ upon his arrival to FC Barcelona. As images of Neymar’s presentation shot around the web on Monday, Mundo Deportivo dedicated part of their website to news exclusively relating to the Brazilian forward. Among the photo galleries, editorials and interviews, the Catalan daily makes special mention of the footballer’s ability to increase Barça’s level of play next season. “Neymar flips the Camp Nou on its head,” says Sport. The sports daily notes that only one other footballer in the history of the Club has garnered more attention during his presentation as an FC Barcelona player, Zlatan Ibrahimovic.